When talking about sound and color therapy, we must first talk about frequency. Frequency is energy and it comprises everything around us including sound, color, essential oils, food, and humans and animals. The human body has a frequency of 62 to 68 MHz. When we are sick, our body frequency lowers. For humans, disease frequencies start around 55 MHz and death begins at a frequency of 25 MHz. Our bodies can be both harmed and helped by frequencies. When the frequency of something is higher than that of our body, it causes an interruption. For example, cell phone towers have a frequency of two billion hertz. The interruption in the human frequency caused by this exposure has been linked to headaches, memory loss, low sperm count, cancer, birth defects, heart conditions, and Alzheimer's. 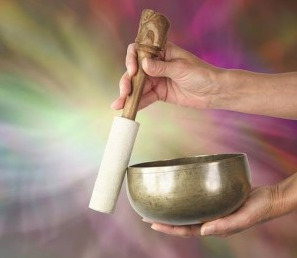 By using sound and color, we can promote healing in the body and restore it to its natural frequency. Red is used to stimulate the sensory nervous system, which energizes the senses. It also helps build up the liver and blood and is a counter-agent for burns from X-rays and ultraviolet lights. Orange is an antispasmodic. It can be used to build the lungs, thyroid, and bones. It stimulates the stomach and increases milk production. Yellow stimulates the motor nervous system and lymphatic system. It increases bowel movements and helps with intestines, pancreas, and digestive fluids. It can also be used to expel worms and parasites. Lemon dissolves blood clots, expels mucus from the lungs and produces a favorable change in the processes of nutrition and repair. It is also helps build bones and the thymus. Green stimulates the pituitary gland and the rebuilding of muscles and tissues. It destroys microorganisms, germs and bacteria, and also prevents decay. Turquoise is used as a skin tonic to rebuild burned skin. Like lemon, it also produces a favorable change in the processes of nutrition and repair. Blue relieves itching and irritation of the skin. It can also be used as a mild sedative, pineal stimulant, and to reduce or remove fever and inflammation. Indigo builds the parathyroid and depresses the thyroid and respiratory system. It also lessens excitement and over-activity, and arrests discharges and hemorrhages. Violet is used as a spleen builder and lymphatic gland depressant. It promotes production of white blood cells and also decreases activity of the nervous system. Purple decreases sensitivity to pain and increases functional activity of the veins. It also lowers both blood pressure and body temperature, and can be used to control fevers. Magenta is great for emotional balancing and building the aura, heart, blood, kidneys, adrenals, reproductive system, and kidney areas. Scarlet stimulates the kidney, adrenal gland, emotions, reproductive system, and activity of the arteries. It raises blood pressure and can help speed up the birthing process. The Solfeggio Scale (tuning forks) works on rhythm and tones that form the basis of the universe. At right is a diagram depicting the affects that different frequencies of the scale can have on our body. What do you think -- Would you be interested in using sound and color to heal your pet?